I don't know about you, but the extreme heat we have been enduring recently has left me a bit lethargic. I have all these ideas for things I want to do, but my get up and go seems to have gotten up and gone. 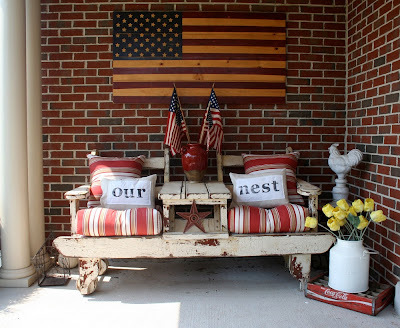 I love sitting on the porch, but only the early mornings seem to be a good time for that right now, and since I don't have a big porch where I am living now, I thought I would look at how other people are decorating theirs. That way, when I do get a big front porch, and the weather is cooperating I'll be prepared. I love this vintage country decor porch from Barn Owl Primitives. The sweet pillows can be purchased from Little Miss Momma on Etsy. Enjoy your Saturday and stay cool. I love that fancy and primitive shot. That is a porch I would love to hang out on. I know what you mean about the heat. I've been doing as much as possible inside. It does zap your brain. Oh I want to move into redstickranch's place. How gorgeous is that? Thanks for sharing these. I love front porches! These pictures are amazing! Thank you for sharing! You found some sweet porches. I'd love to have a porch--but wouldn't use it in this heat. Whew! I agree with it being too hot to begin any projects. We just lost 10 degrees with a storm. Happy, happy me! We don't really have front porches in Arizona, everyone hangs in the backyard by the pool. I miss them. Love all the photos. Keep cool and God bless. I love those photos. Sometimes it is good just to sit on our porches and think, doing NOTHING. I actually love my backyard and it gives me such joy. Those are beautiful! 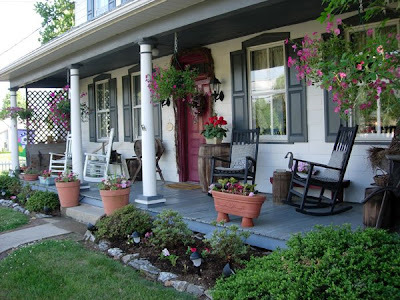 I think I could live in almost ANY house if it had a great porch tacked on the front! :) Nice to meet you! How wonderful! I've never had a porch- now I want one! 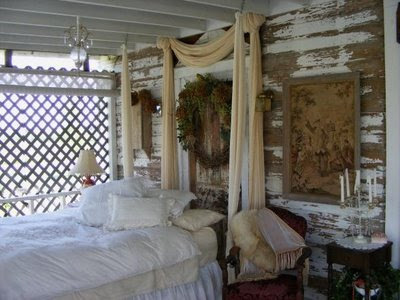 Each image creates such wonderful feelings of rest and comfort- especially the sleeping porch! I could see myself hanging out in several of them. 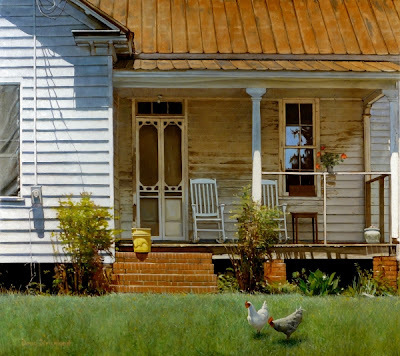 *Sigh* I want very much to lounge on a rocking chair on a lazy afternoon upon seeing these photos. I can see myself sitting there with my friends chatting about baseball and NASCAR.